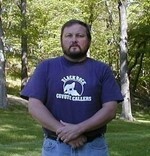 John Brady is the manager of Black Rock Forest. Thousands of students, like these third graders from Cornwall-on-Hudson Elementary, benefit from educational programs at Black Rock. John Brady, who has manages the beautiful trails and other resources of the Black Rock Forest Preserve, has received a new environmental award for his hands-on relationship and uncommon understanding of the natural world. The New York team of the Global Sports Alliance presented its inaugural Environmental Stewardship Award to Brady, Forest Manager of Black Rock Forest in Cornwall, NY. The Global Sports Alliance (GSA) is an official partner of the United Nations Environment Programme and is a global network of sport enthusiasts that want to leave a healthy environment for our future generations. GSA is working to promote environmental awareness and action among more than one billion sport enthusiasts worldwide by spreading a new concept, “Ecoplay”, as a fundamental part of sportsmanship. “Ecoplay” means to enrich nature, save energy and reduce material consumption. Black Rock Forest offers a remarkable opportunity for outdoor enthusiasts to hike, fish, run, and bike along 30 or so miles of trails and roads. The preserve is also a laboratory for scientists studying and teaching environmental issues. John Brady has been Black Rock Forest's manager since 1979. John manages the Forest and its facilities. He oversees access, safety, forest equipment, forest management, and the work of the Black Rock Forest Crew (both paid and volunteer, who do most of the physical labor and upkeep around the Forest). John is active also in the forest's research programs, assists visitors in their adventures in the Forest and runs the Forest sawmill. He teaches classes for Barnard College, Columbia University, the American Museum of Natural History and many others. As an educator, he has developed many programs including the current brook trout project. John says that learning about Black Rock’s history and its plant and animal life remains his favorite pursuit. GSA-NY team captain Kevin Trotta said "As the first recipient of this award, John has set the bar very high. In his work he studies and defends nature and points the way to a future where humankind lives, and plays, in balance with the natural world." Outstanding! John is a local, if not national, treasure. A very fitting award. John's contributions to environmental and wildlife preservation make the forest and Cornwall a better place.